The celiac ganglia or coeliac ganglia are two large irregularly shaped masses of nerve tissue in the upper abdomen. Part of the sympathetic subdivision of the autonomic nervous system (ANS), the two celiac ganglia are the largest ganglia in the ANS, and they innervate most of the digestive tract. They have the appearance of lymph glands and are placed on either side of the midline in front of the crura of the diaphragm, close to the suprarenal glands (also called adrenal glands). 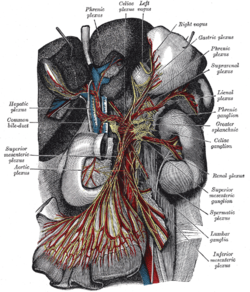 The ganglion on the right side is placed behind the inferior vena cava. They are sometimes referred to as the semilunar ganglia or the solar ganglia. The celiac ganglion is part of the sympathetic prevertebral chain possessing a great variety of specific receptors and neurotransmitters such as catecholamines, neuropeptides, and nitric oxide and constitutes a modulation center in the pathway of the afferent and efferent fibers between the central nervous system and the ovary. The main preganglion neurotransmitter of the celiac ganglion is acetylcholine, yet the celiac ganglion-mesenteric complex also contain α and β adrenergic receptors and is innervated by fibers of adrenergic nature that come from other preaortic ganglia. The upper part of each ganglion is joined by the greater splanchnic nerve, while the lower part, which is segmented off and named the aorticorenal ganglion, receives the lesser splanchnic nerve and gives off the greater part of the renal plexus. These ganglia contain neurons whose postganglionic axons innervate the stomach, liver, gallbladder, spleen, kidney, small intestine, and the ascending and transverse colon. They directly innervate the ovarian theca and secondary interstitial cells and exert an indirect action on the luteal cells. Modifications in the adrenergic activity of the celiac ganglion results in an altered capacity of the ovary of pregnant rats to produce progesterone, suggesting that the celiac ganglion-superior ovarian nerve-ovarian axis provides a direct link between the autonomic nervous system and the physiology of pregnancy. It has also been shown that modifications in the cholinergic input at the celiac ganglion also led, via the superior ovarian nerve, to modifications in ovarian steroidogenesis. Most of the fibers of the superior ovarian nerve come from the postganglionic sympathetic neurons of the celiac ganglion. ^ a b Casais, Marilina; Delgado, Silvia M; Sosa, Zulema; Telleria, Carlos M; Rastrilla, Ana M (2006). "The celiac ganglion modulates LH-induced inhibition of androstenedione release in late pregnant rat ovaries". Reproductive Biology and Endocrinology. 4: 66. doi:10.1186/1477-7827-4-66. PMC 1769501. PMID 17184551. ^ Orozco, A. V.; Sosa, Z.; Fillipa, V.; Mohamed, F.; Rastrilla, A. M. (2006). "The cholinergic influence on the mesenteric ganglion affects the liberation of ovarian steroids and nitric oxide in oestrus day rats: Characterization of an ex vivo system". Journal of Endocrinology. 191 (3): 587–98. doi:10.1677/joe.1.06859. PMID 17170216. ^ Forneris, Myriam; Oliveros, Liliana; Aguado, Luis (1999). "Effect of Secretion of Splenocytes after Superior Ovarian Nerve Section on the Ovarian Steroidogenesis". Neuroimmunomodulation. 6 (4): 293–9. doi:10.1159/000026387. PMID 10393515. Essentials of Human Physiology by Thomas M. Nosek. Section 6/6ch2/s6ch2_30.